Article by Canterbury Earthquake Recovery Authority (CERA). You might expect the business of an air force museum to be old planes – not artefacts rescued from a temple or the proceedings of a dentists’ convention. But in post-earthquake Christchurch, this is all part of the mix at the Air Force Museum of New Zealand. And it’s proving to be a head turner internationally, as well as a huge boon for the city. Director Thérèse Angelo says the new cultural recovery centre set up at Wigram is drawing world attention in heritage circles because it has broken the mould for conventional museum behaviour post disaster. The usual institutional practice after a natural disaster, Thérèse says, is to turn inwards and focus on protecting your own collection. “But we ended up looking outwards, at what we could do for our community. This has involved forming a diverse set of partnerships, that bridge small museums and specialist archives in Canterbury, the big heritage players in the city and central government, and the commercial event company owned by the city council. A significant extension to the museum now hosts the Canterbury Cultural Collection Recovery Centre as well as an interim convention centre. This wasn’t a mission the Air Force Museum had planned on. But after 22 February 2011, the facility found itself in a unique position – it was on a big area of stable land with large undamaged buildings, while the city’s central institutions like the Canterbury Museum and Christchurch Art Gallery were closed. Thérèse was well known in the museums sector, as the current chair of Museums Aotearoa. The calls began to flood in: can we bring stuff to you to store, maybe in a container? There was only one possible response: “Anything we could accommodate, we would”. 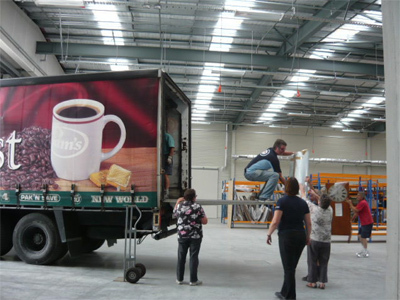 The museum became home to a diverse range of agencies (including the IRD, the Family Court and High Court, and the Christchurch Symphony Orchestra), and a storage centre for over 20 collections. An extension planned since 2004 and two-thirds funded was fast-tracked, with the help of earthquake relief funds and a Regional Museums grant from central government. This 6400 m2 building opened in January 2013. The recovery centre now securely houses the treasures of 22 small and medium organisations that lost buildings in the quake, ranging from a few precious items from the Hebrew Society to the salvaged contents of the Lyttelton Museum. 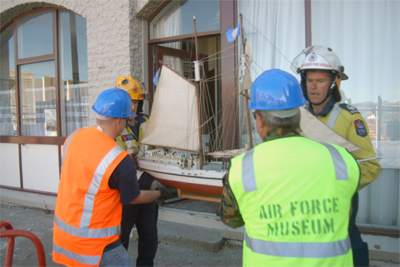 Kaiapoi Museum collection being moved in. Central agencies were only too pleased to join this partnership. National Services Te Paerangi manager Victoria Esson says it’s been fantastic to be able to back a single organisation that is supporting so many others on the ground in Christchurch. The Te Papa-based support service for museums, galleries and iwi around New Zealand is funding an intern at the recovery centre, who will be devoted to rehousing and conserving the artefacts stored there, working closely with their guardian organisations. The recovery centre will also host training programmes using Te Papa and other expertise to help Canterbury groups care for their collections, and to work towards new independent homes. The global interest in the Air Force Museum’s post-disaster outreach is a boon for the sector nationally, Victoria says, because with that interest comes international expertise and rare training opportunities. She says the collaborative approach taken by Thérèse and her team has huge advantages for all. The Ministry for Culture and Heritage also enthusiastically endorses the recovery centre project. Ministry adviser Mary Sinclair says it is already showing excellent return on the $2 million grant made to the building project. 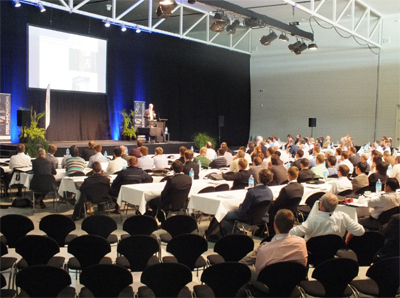 It was also impressive that the Air Force Museum chose to host an interim convention centre for Christchurch in the remaining space in the new building. Thérèse Angelo says the conference and event centre is a logical expansion of the museum’s existing commercial activities. As well as helping the city’s recovery, the new income also improves the charitable trust’s ability to support itself. The partnership with Vbase to run the convention centre was going well, after a period of adjustment to working with the commercial realities of a venue management company. General manager Russell Kenny says merging the sales-driven ethos of Vbase with museum culture had taken some effort, which was now paying off. Although the new Conference and Events Hall only opened for business in February this year, forward bookings for conventions and one-off gala events were already strong (with 2014 looking extremely busy) – with good flow-on prospects for the recovering hotel sector. Thérèse says the museum’s new collaborations have been fantastic for the museum – in terms of income and reputation and development of professional practice. Best of all though, were the benefits to the city’s heritage sector, and to her staff.